"You can make a gigantic impact." Like countless others, former Vice President Joe Biden has experienced the horrors of cancer up close. In 2015, his son Beau died at the age of 46 after a battle with brain cancer, a tragedy that inspired the vice president to spend much of his last year in office working on a "cancer moonshot" -- an initiative that helped pass a $6.3 billion research bill at the end of last year. 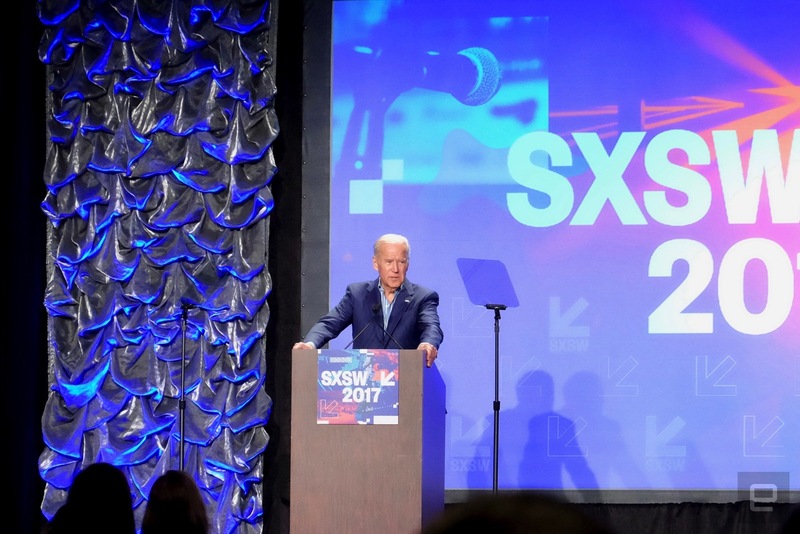 At SXSW 2017 yesterday, Biden told a packed audience how his son's death kept him from running for president but spurred him into intense action that will continue in his private life. And he also implored the audience to use their talents to help make "gigantic progress" in the ongoing battle to detect, treat and prevent cancer. "I had one regret in making the decision not to run," Biden said, "and that was I would have loved to have been the president who presided over the end of cancer as we know it." Biden made that "offhand" remark when he made the decision after his son's death not to run in 2016, and President Obama picked it up and ran with it. "Shortly after I made that comment, the president approached me and said, 'we ought to be doing more'... and to my surprise, at the State of the Union he announced to the world that I was going to be 'mission control' in his cancer moonshot." Biden then spent the better part of an hour recounting his learnings from the last year or so, much of which focused on the need for better collaboration and communication between researchers, hospitals, doctors, drug companies and patients -- basically, everyone involved in combating cancer, and many who might not be. When talking about including unexpected partners like the department of energy and NASA in his work last year, he noted that "I don't know any outfit that knows more about radiation than NASA." Radiation therapy is one of the main ways to fight cancer. "It kills the bad guys, but kills a lot of good cells too, even when it's really precise," he said. At this point, however, Biden is hardly satisfied with the collaborations we're seeing, even though he recounted lots of progress made. One success story he recounted was the National Cancer Institute's "Genomic Data Commons" -- a repository of cancer sequencing data and related patient info. Biden said it had 14,000 records last year, but the data wasn't available to anyone. Biden worked to make it accessible by anyone, for any reason, and he said that since June the number of records has more than doubled to about 30,000. Biden also arranged agreements with 10 countries to have them share similar data. "The hope is there will be tens of thousands more patients, increasing the commons and hopefully exponentially we'll have more data to be able to be examined to unlock some of the secrets this dreaded disease hides," he said. As he talked about gathering more data and running supercomputing tests on it, Biden noted that Amazon stepped up and donated free cloud storage space to hold the work and make it more easily accessible. "Before this you might say, 'What does Amazon have to do with curing cancer? '," he said before adding that the data from this project has been accessed 80 million times since last year. "That's hope," he said. Indeed, much of Biden's work seems to have focused on breaking down the many logistical, technological and bureaucratic barriers. He said lots of things that were stopping progress weren't "cancer problems" -- challenges coming from the disease itself. We're hardly out of the woods, though, and Biden spent the last part of his speech imploring the SXSW audience to contribute how they can. "South by Southwest has brought together some of the most creative minds in the world, creators in entertainment, music, science, technology," he said. "You all might think that the patient medical data, research data, clinical trial data is really shared in this high tech world of instant communication, but it's not." That was just the first in a series of hard truths about how fragmented the battle against cancer can be. "You might think that when companies or researchers and universities have a trial that fails, they would let the research community immediately know it by posting the data to avoid other people going down the same rabbit hole," he said. "They don't." After spending two minutes going down a list of similar problems, he implored the crowd to use their talents to help. "You're the future. Many of you are developing technologies and innovations for purposes large and small, fun and serious, entertaining and life saving. They have nothing to do with cancer, but you can make a gigantic impact," Biden said. He grew more animated, impassioned and almost angry as we he went on. "We need you to help us reach people who need to change their behavior and avoid cancers. You'll do it for helping people figure out how to buy a product," he said, with a note of disdain in his voice. He didn't go so far as to say that people are using their talents on frivolous or unimportant pursuits, but there was definitely an undertone of disbelief at the things companies focus on -- at one point he even noted how crazy it was that he could look up movie times for any theater in the country but not make more progress against cancer. Biden did end on a positive note, saying that he was talking to "some of the most innovative minds in the world" and hoping that "your generation can be the first to go through life with a different understanding of cancer as a preventable and controllable disease." And even if you're not a scientist or cancer researcher, Biden wants you contributing and helping break down the barriers that have been built up around the disease. "If we did nothing more than break down the silos preventing greater collaboration because of the way the system has been built up -- not intentionally -- over the last 50 years, we can extend the life of a lot of people with cancer," he said. It was a sobering speech at an event known as much for its parties as its panels, but it was inspirational as well. Here's hoping the audience took his words to heart. If the post-panel mob scene of attendees trying to shake Biden's hand and take his photo for a good 20 minutes was any indication, he got through to at least some of those in attendance. Click here to catch up on the latest news from SXSW 2017.